Quilt-As-You-Go is a wildly popular quilting technique these days. As you might suspect from the title, it allows you to quilt as you piece, rather than piecing the entire quilt and then quilting it. It is a time saver and for someone like me, with a tiny space, it helps me get the bigger quilts done. I don't own the book and I haven't read it. 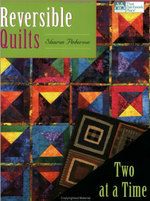 But, the reviews are glowing (which is not true for most of the other quilt-as-you-go books). 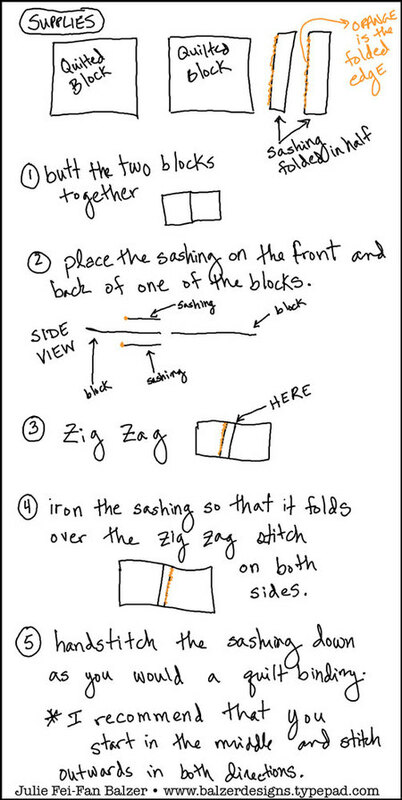 And, as the title indicates, one of the things that is so very cool about the Quilt-As-You-Go method, is that you can create a two-sided quilt -- a quilt that works from the back and the front! That's very cool in my opinion! In other news, this will probably be my last post for a while as I am going away for a week and I'm not sure if I'll have any internet access. I'm still planning on doing Photo A Day. But, I probably won't have a chance to post any of them until I come back. I hope you play along too! I was bored and stuck in Scranton, PA where I knew no one. So, I wandered into an AC Moore, watched old episodes of DIY scrapbooking, and found inspiration! 2. What is your creative process? I am a messy creator. I take out everything. I paint. I draw. I sew. I have piles of fabric and paper and stuff everywhere. I use what's on the top of those piles and then I go digging. I'm always happiest when I start with a story I want to tell and a plan and then abandon it completely. I feel that accidents are opportunities. I like to experiment. The only thing that remains constant about my process is its intensity. I can sit and work on something for days at a time, staying up all night, restlessly sleeping for an hour or two, and then diving back in. I have a driving need to complete things. (Can you tell I don't have kids, yet?) I am obsessive! 3. Why do you create? This sounds appallingly simple, but I create because I have to. It's like asking me why I breathe. I create in order to survive. I strive to live a creative life. It feeds my soul, my heart and my brain. 4. What is your favorite thing to do? 5. Do you have any favorite manufacturers? So many! Basic Grey paper rocks my world! I love Maya Road chipboard! Daisy D's has some really awesome paper these days too! Love Fancy Pants stamps! I'm a big fan of so many Making Memories supplies. Technique Tuesday and Autumn Leaves also rock the stamps! I love paper by My Mind's Eye. I totally dig Ranger inks and paints. Prima is every girl's favorite. I like lots of the stuff from Creative Imaginations. 7gypsies is AWESOME across the board! American Crafts D-ring albums are a current super fave! I'm crazy about Collage Press papers these days too. I certainly can't forget 2Daisies Designs and Sultane! Hambly makes the world go round...Gosh. I think I'm leaving out some very important names, but the truth is, there are so many things I adore! 6. What is currently your most favorite thing you have created? A quilt I made about me. It's a ton of individual mini art quilts held together by a network of beads and it's called "The Sum is Greater Than the Parts." 7. How has your style evolved? Hmmmm....I think it has become more graphic, as I've learned more about design principles. I've always been kind of freestyle. I used to be a lot more so. 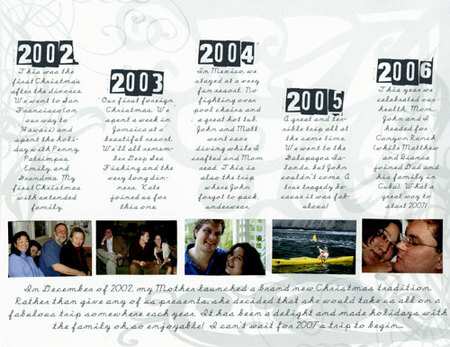 But, when I got into the whole publishing thing, I think I really pulled back and tried to make some commercial type stuff. But, my great love and the stuff I like the best, can be described as Cultural Anthropology with a handmade look! I think it's fantastic! Personally, I love the artistic outlet and feel that it's something everyone should try at least once! 3. You have just won a $100.00 shopping spree to your favorite LSS. You have 15 minutes to use it. What do you get? The expensive stuff! Stamps, cute but impractical embellishments that I'll never use, albums (which are criminally expensive) and all the paper I can grab a hold of! That's probably way more than $100, though! 4. It's your lucky day! You have just won another shopping spree! $1000! To Bass Pro Shops. What do you do with it? 6. Your favorite band is doing a reunion tour, and they are coming to YOUR town...the last stop on their LAST TOUR ever. Your best friend has gifted you with tickets...front row, center stage, PLUS backstage passes! Your one chance to meet your idols. THEN....Lisa Bearnson calls and wants you to be her guest at an event. All expenses paid, lots of prizes. Pretty much a once in a lifetime chance. WHAT DO YOU DO? This is too easy. There isn't a band on earth that I idolize, so I'd head off with Lisa Bearnson. Now, if you gave me the choice between Lisa and having a conversation with Jack O'Brien (a famous Tony award winning stage director), I'd be more torn! 7. You are stranded in a hotel conference room with 10 people who want to learn how to scrapbook. They are all men, ranging in age from 35-80. What do you do? Teach them to scrapbook! I don't think the fact that they're men is an issue. It's more an issue that all you've got is hotel conference type supplies. I guess we'd focus on design principles and journaling. 8. The Burger King King or Ronald McDonald? Ronald McDonald. He takes care of sick kids and their families (The Ronald McDonald home)! Day 25: What's your favorite Christmas memory? Hybrid layout here. I'm having a lot of fun with these lately! Day 24: Do you leave cookies and milk for Santa? On a side note, this is my blogging anniversary. One year ago today, I started this blog! I can hardly believe that it has only/already been a year! I think I'm going to order a Blog Book. There is this site called, Blurb, which is a self-publishing site, but it has this cool thing where it will automatically slurp your blog and plonk it into a book. So, you can have a real life copy of all your ramblings and photos and such. It sounds really awesome and the prices seem reasonable. So, I might try it. One year in my life and such. Day 23: Do You Bake Christmas Cookies? This was a very fun layout to make. I just used what was sitting on my desk! Lots of doodling too! 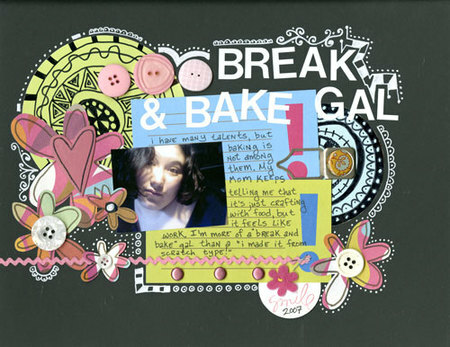 The effer girls have a fresh, funky scrapbooking style and the journaling and subjects are always super real. Past challenges have included everything from, "Naughty Girls Need _____ Too" to"Create a layout using office supplies." Look for lots of freestyle fun and new challenges every other week! Such a fantastic blog! It's full of reviews, ideas, and instructions. The blog has five creative girls who each post at least once a week, so there's always lots to see! The two most recent posts are a review of "Scrapbook Play" and a piece of metal art posted as inspiration. This is a relatively new read for me. I enjoy getting a bit of a backstage peek into the magazine. There are giveaways and sneak peeks into both Quilting Arts and Cloth Paper Scissors as well as calls for publication. Tons of eye candy too! You don't need to be a sewing enthusiast to enjoy this blog! I'm a big fan of eye candy and this blog showcases layouts featuring more than three photos. Tenika, the woman who runs the blog, showcases a wide range of styles and so you're sure to find something to suit your fancy! Scrapbook Dimensions - The Scrapbook Dimensions blog is fantastic! 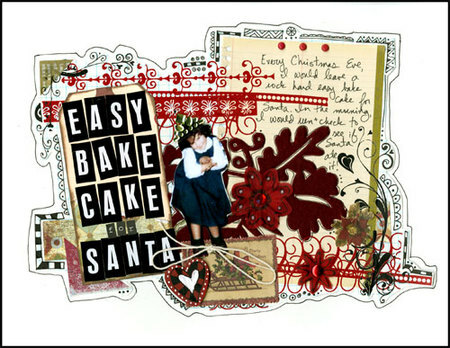 If you're at all interested in hybrid scrapbooking, you must visit this site! There are easy to follow tutorials (even for newbies), organization tips, and lots of pictures. A word of warning, this blog is formatted slightly differently from the blogger and typepad blogs we're used to, but it's easy to figure out. And well worth it too!